PlusUrbia Design’s vision for the renowned Wynwood arts district has been selected for an American Planning Association of Florida (Florida APA) Award of Excellence in the Neighborhood Planning category. The prestigious statewide honor recognizes the studio’s plan that supports Wynwood’s creative industries with mixed-use development, walkable streets and open space. The award recognizes PlusUrbia’s Wynwood Business Improvement District (BID) planning report. The studio’s recommendations ultimately led to the City’s adoption of the Wynwood Neighborhood Revitalization District (NRD-1) to guide future development in the area. It will be presented during APA’s statewide conference in September, in Tampa. The plan promotes mixed-use development, including manufacturing-enabled retail. Smaller units serve millennials and artists with affordable apartments and live-work units. To preserve light industry, galleries and shops, a Transfer of Development Rights program was implemented to reduce development pressures on legacy structures. Coupled with a parking buy-down program, the Wynwood NRD is promoting new urban typologies in Miami. PlusUrbia collaborated with the Wynwood (BID), City of Miami Planning and Zoning Department and Akerman law firm. 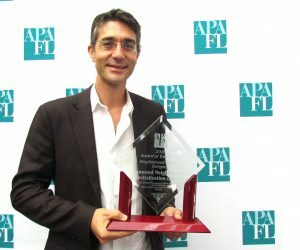 The studio’s Wynwood plan earned the APA’s America’s Great Places Award and the Gold Coast Chapter’s Best Plan in 2015.